The AEC has finalised results for Macquarie (despite 115 ballots going missing). Louise Markus won by a final margin of 2135 votes with a swing of 1.49% on preferences. 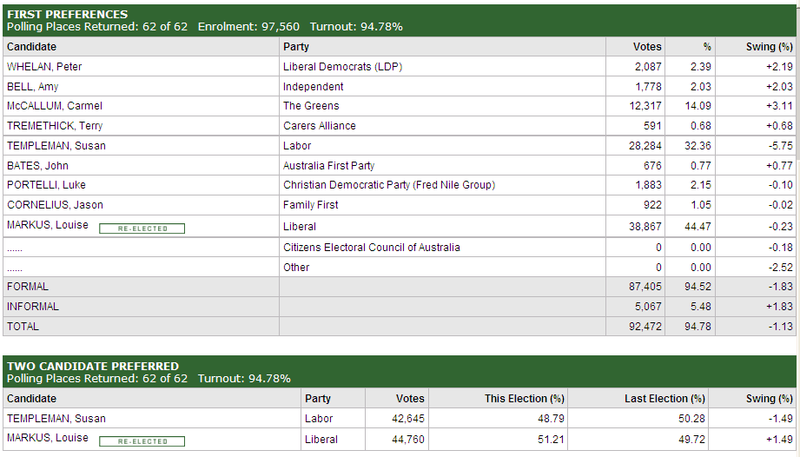 Interestingly, both the Labor and Liberal experienced swings against them on first preferences. This entry was posted on Wednesday, September 15th, 2010 at 2:23 pm	and is filed under News. You can follow any responses to this entry through the RSS 2.0 feed. You can skip to the end and leave a response. Pinging is currently not allowed.